Weddings & Florals – Lammscapes! 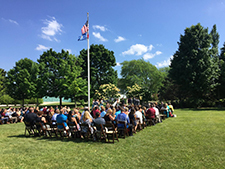 Host Your Event at Lamm Gardens! 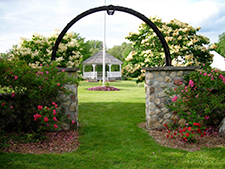 We have beautiful landscaped gardens, a pavilion with stone archway entrance and spacious lawn area surrounded by flowers & trees. Natural areas for photographs include a small lake, trails, Cedar Creek and historic bridges. Parking areas are accessible to all event areas. 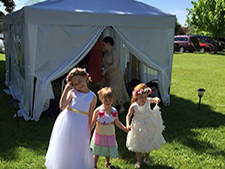 It is recommended to rent tents, tables, chairs and portable restrooms for your event. Smaller picnic areas and rustic log building available for wedding showers and family gatherings. 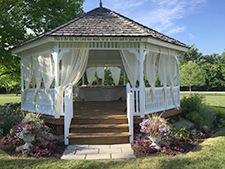 Our Garden & Design Center can provide floral services, including natural decor, centerpieces, wedding party flowers and display services at any location. 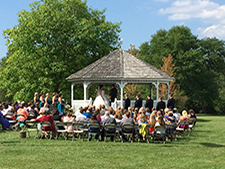 For a tour of our garden areas or more information, please call (262) 677-3010 or email us weddings@lammscape.com. Interested in floral & display services for your next special occasion at floraldesign@lammscape.com.